GraphicsGale is a freeware grid-based image editor that allows you to create a variety of different types of images from scratch by editing pixel-by-pixel. The user interface of GraphicsGale is pretty dated, yet gives you an interesting retro feel when you're editing the images. Because of its pixel-based editing capabilities, it's actually quite easy-to-use. Some of the tools it includes are a pen, split curve, rectangle, oval, flood fill and text, among others. Version 2.08.21 is a freeware program which does not have restrictions and it's free so it doesn't cost anything. 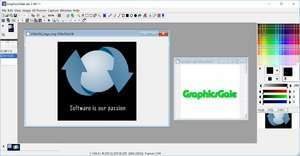 For security reasons, you should also check out the GraphicsGale download at LO4D.com which includes virus and malware tests. Additional screenshots of this application download may be available, too.